I recently had an issue where I had a custom post type of Artist, and another of Artwork. 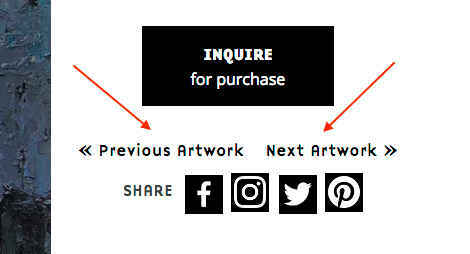 When looking at a single piece of Artwork, I used posts2posts to get the related Artist, and then I also did a query to get an array of all of the other Artwork by that Artist. I used that array to render them as thumbnails below the main Artwork. The related Artwork array really isn’t sorted in any way. It’s a standard post array, with incremental keys. Initially I used WordPress’ built in functions for previous and next post, but that relied on the chronology of all Artworks, irrespective of Artist, so they immediately left the current Artist and went to something unrelated. which got me a very concise array of array keys matching my post IDs. The post_title is a red herring, I don’t use it. I needed to take my Art array and get the ID of the post on either side of the current Artwork. I looked at prev() and next() but messing with the array pointer doesn’t work in a for loop, so it was a pain. I found some code in the comments for the next() function that came close to what I wanted, but left some things to be desired. So I used it as a base and ended up with the function below. * key is last in the array, then next is null. * element in the array. Then you get your data with something like this, where $current_art is just the current post ID. Those are post IDs, so I was able to simply drop those into get_permalink() for my next/prev links.